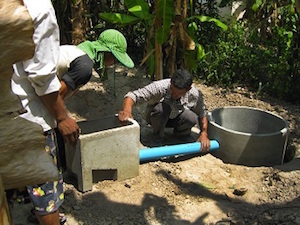 The Cambodia Easy Latrine is a low-cost sanitation system that villagers can build themselves from locally available materials. The sanitation system consists of a pan, a bucket of water with a ladle, and pipes to connect a hut to a latrine buried in the ground. The latrine itself has three receptacles made from rings of concrete bound by the ash of rice husks — material that is readily at hand and less expensive than cement. Once a receptacle is full, it can be capped and, after two years, the sediment can be used as compost. Each easy latrine can be made for approximately $25 USD. iDE Cambodia is a branch of iDE that is based in Cambodia and focused on program implementation in that region.